Pork Salpicao is a Filipino dish of Spanish influence. The meat are cut into small pieces and marinated in olive oil and sauteed with lots of garlic. This recipe can double as both appetizer and main dish! Slice pork into cubes. Set aside. Combine olive oil, salt, and ground black pepper. Stir and then add crushed garlic. Mix well. 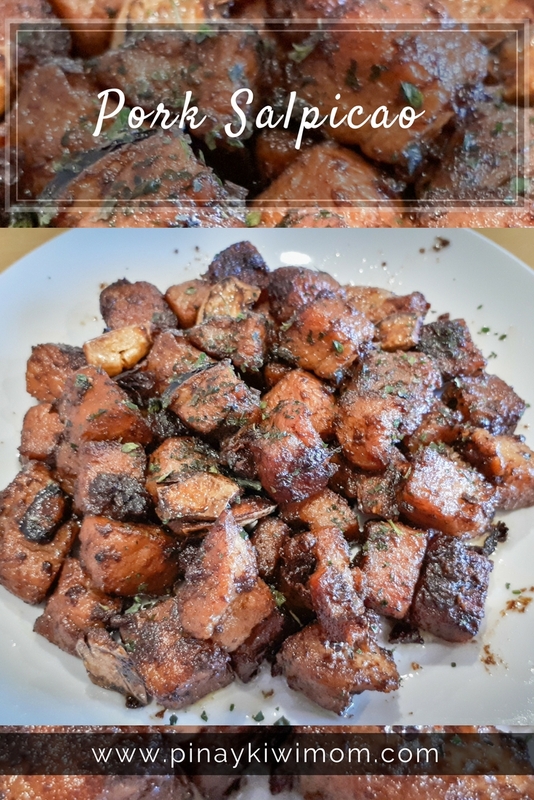 Put cubed pork in a bowl and pour olive oil mixture, strain garlic using a fork or spoon since it will be cook the separately. Fold pork and make sure that all are coated with olive oil. Let it stay for 230 minutes. This will let the pork absorb the oil along with the flavors infused in it. Heat a pan. Once hot, add garlic with the remaining oil. Cook until it turns brown. You may add up to 1 teaspoon of oil if needed. Transfer the browned garlic in a bowl. Continue to heat the pan with the remaining oil. Add oil-marinated pork (including the oil). Stir-fry in high heat until the pork turns brown. Add half of the browned garlic. Stir. Add worcestershire sauce and oyster sauce. Continue to cook in high heat until the sauce completely evaporates. Add butter. Continue to cook until it melts.